The Ashippun Volunteer Fire Department was established in 1917 with 19 charter members. 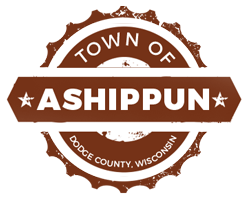 Ashippun had the first community-owned fire department in the state of Wisconsin. The department was reorganized in 1959 forming a corporation. The Town of Ashippun contracts with the Ashippun Volunteer Fire Department to provide fire and emergency medical services for the township. The department presently serves approximately 52 square miles including the Towns of Ashippun, Oconomowoc, and Erin in addition to providing mutual aid to many other local departments. Equipment is housed in two locations. Station 1 is located at the intersection of Oak Street and Hwy 67 in Ashippun. Station 2 is located at the Town Hall (corner of Hwy P and Hwy O). The fire department is very proud of its equipment, the newest of which was purchased in 1999. The department is completely volunteer and is supported through several fundraisers. The main fundraiser is the Fireman's Picnic which is held in July. Please contact the current Fire Chief for more info.